Born on April 15, 1985 in Myrhorod, Poltava region. In 2002 graduated from school No. 17 in the city of Poltava. In the period from 2002 through 2007 attended Yaroslav Mudryi National Law Academy. Specialist in justice studies, lawyer. In 2010 received a second university degree in Poltava University of Economics and Trade, specialists in international economics. In the period from 2007 through 2015 – worked in prosecutor's office of Ukraine, received several awards from senior officers. In the period from 2016 until present – Director of the Precedent law and consulting center. Provides legal services to enterprises, including in relation to the attraction of official dealers of enterprises with foreign investments like Nissan, Оpel, BMW, MAZDA, FIAT and others to cooperation in Ukraine. 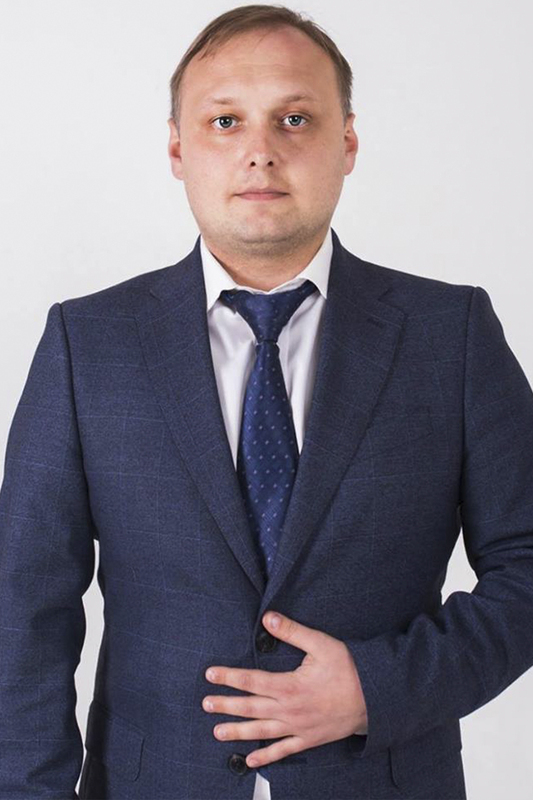 Since March 3, 2018 – Chairman of Poltava City Organization of the Socialist Party of Ukraine. The SPU was the initiator of the adoption of the Constitution by the Parliament in 1996. The "Constitutional Night," when parliamentarians worked on the Constitution until the morning, allowed Ukraine to avoid a political crisis - if the Constitution were not adopted, President Leonid Kuchma would have dissolved the Verkhovna Rada and imposed his version of the Framework Law, which granted the president dictatorial powers. The Socialists played a decisive role in frustrating the attempt to implement the results of the referendum held on April 16, 2000 through parliament. Observers stated that during the vote counting, massive violations were committed at the referendum, and the results of the plebiscite were gerrymandered. One of the questions of this referendum was the creation of a two-chamber parliament in Ukraine - this would have created the prerequisites for the transformation of Ukraine into a federal state and the development of regional separatism. The SPU was totally against the approval of the results of the referendum. The events of 2014 proved the rightness of the Socialists. In 2000, the Socialist Party released information about Kuchma's involvement in the murder of journalist Georgy Gongadze, as a result of which Kuchma became "non-handshakable" in most Western countries. In December 2004, the SPU became one of the main initiators of the adoption of the constitutional reform by the Verkhovna Rada, which transformed Ukraine from a presidential-parliamentary to the parliamentary-presidential republic. In 2004, the party became an associated member of the Socialist International. The SPU was one of the initiators of the "Ukraine without Kuchma" protest movement in December 2000. It failed, but allowed the consolidation of anti-Kuchma political forces, which later played a decisive role in the democratization of the country. The SPU became an active participant in the "Rise, Ukraine!" movement in September 2002. In the first day so far more than 100,000 people took part in it. In 2004, the SPU became one of the most active participants of the Orange Revolution, which did not allow falsifying the results of the presidential elections and led to the power of democratic forces. From 1994 to 2007, the SPU was represented in the parliament by a large number of its members, but in the future the party was not very popular with voters. In July 2017, Illia Kyva headed the SPU. He intended to purify the party and strengthen its positions in the "left-wing field." In December 2017, he announced the beginning of the decommunization of the SPU. As a result, ex-party chairman Petro Ustenko and a number of his associates were expelled from the party - they were unveiled in an attempt to sell the party to the Kremlin, as well as in secret negotiations with other political forces that were at odds with the previous arrangements. During the second stage of the SPU congress held on February 4, 2018 the party proclaimed that the priority for it is patriotism, which implies a complete restoration of Ukraine's control over its territory within the borders of 2013.